Whether you live there, have relatives there, or just love to visit, New York City is a great theme for Bar and Bat Mitzvah parties. Like the city itself, there are so many possibilities for food, decor and entertainment! If you have out-of-town guests, leave these welcome baskets featured on B. Lovely Events at their hotel. Just fill “I Love NY” caps with different “apple” or New York-inspired products, or other treats. Name your tables after different New York City landmarks or neighborhoods. There are so many choices – “Times Square,” “the Village,” “Little Italy,” “Wall Street,” and “Chinatown” are different neighborhoods you can use, while “Statue of Liberty,” “Empire State Building,” “Brooklyn Bridge,” and “Yankee Stadium” are well-known landmarks. For food, either during your cocktail hour or dinner set up “New York”-themed food stations. You can offer a hot dog cart, pretzel stand, pizza truck, or Chinese food. New York has everything! For instructions to create your own candy display like the one above, and links to all of the products you will need, see Step By Step: Create Your Own New York City or Broadway-Themed Candy Buffet. 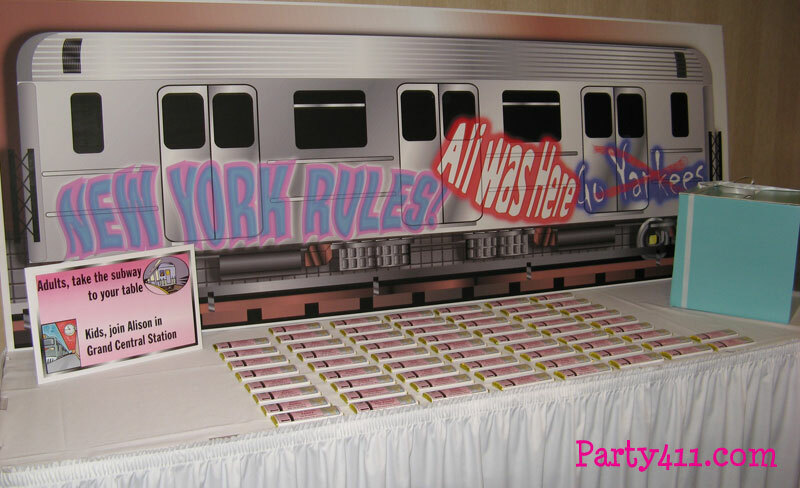 For more New York City-themed favor ideas, see New York Theme Favor Ideas for Your Bar or Bat Mitzvah or Wedding. Set up this authentic New York City news stand from Creative Games at your venue’s exit. You can offer your guests coffee, juice, doughnuts, as well as early editions of the next day’s newspapers! 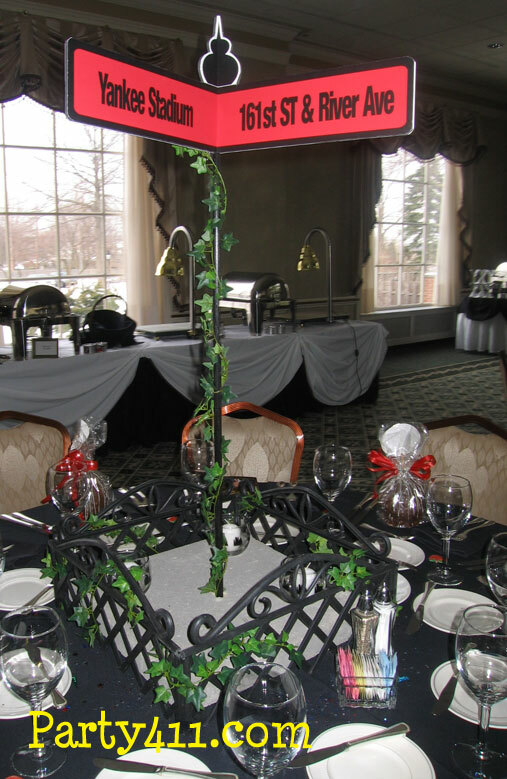 For more ideas, check out our Pinterest Board for New York Themed Bar and Bat Mitzvah Ideas.